On Friday I teamed up with Runner’s Alley, New Hampshire’s only specialty running store, to host the first NH Running Blogger Meetup. We gathered at their new location in Concord for a run around the capitol, a little post-run noshing provided by Stoyfield and Health Warrior and then some networking and gear-chat. Runner’s Alley has long been my go-to place for shoes and running accessories. It’s where I bought my first pair of running shorts when I finally made the switch out of wearing my high school mesh basketball shorts. And when I was in shoe limbo in 2012 (between shoes because Asics discontinued my favorite shoe) their knowledgeable staff helped me look around at all the options and ultimately fitted me with the perfect shoe. Practically every running accessory I own comes from their store: my Garmin, The Stick, my Feetures socks, my pepper spray, my GU stash. Not to mention a good portion of the apparel I own I’ve snagged at their incredible sidewalk sale during Market Square Day at their Portsmouth, NH location. Not only is Runner’s Alley a great store, it is a community hub. Out of each of their locations they host weekly runs, training clubs for every distance from 5K to the half marathon, a Winter Warriors group that’ll keep you running on the bleakest days and educational events like PT night where a local Sports Physical Therapist comes in to chat about running and injury prevention. Jeanine Sylvester, the stores founder and owner is also incredibly supportive of the local racing community and sponsor countless races including Reach the Beach which I’ll be running at the end of the week. To put the event together I contacted Jeremiah, social media coordinator for Runner’s Alley and member of the Concord store team. We actually go way back, we were RA’s together at the University of New Hampshire in our college days It took a bit of time to get the ball rolling and a lot of NH bloggers were very interested but ended up with conflicts so we had a smaller turnout that expected (as in one other blogger and me). Despite the small turnout we had a fantastic evening! Jeremiah stocking the shelves before the Concord store’s opening. Jeremiah did a fantastic job leading us on the run around Concord. He took us up past the State Capitol Building out towards the hospital and then along a parkway that led us past cornfields. Who knew their were corn fields just two miles out of downtown Concord? It was a beautiful evening and the sun was setting over the fields as we ran past them. We looped back into town and finished back up at the store. Thanks to Stonyfield and Health Warrior we had some excellent post-run snacks. Stonyfield, a New Hampshire based company, provided us with the newest addition to their product line, the super creamy and delicious Petite Creme. Health Warrior also provided a sampling of their chia bars. While we refueled Jeremiah gave us a tour of the store and highlighted some of the new fall gear, pointing out some of the great new jackets from The North Face. He has been working in the field for ten years and has a broad knowledge of shoes, shoe brands and gear. He’s also witnessed the changes in the shoe industry in the last few years with a move towards minimalism and can really speak to the history of the shoe industry. We chatted about some of shoe brands that have been making changes and coming out with new stuff, most notably New Balance. They are a shoe that I have never tried until recently and am particularly interested since they two are a “local” company based out of Lawrence, MA with two factories in Maine. After our gear chat Jeremiah awarded Christina from CrazyMamaRunner with a gift certificate for a free shoe fitting and new pair of running shoes! 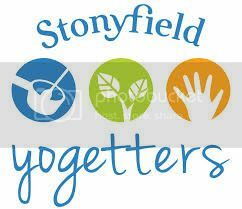 We each walked away with a great swag bag from Runner’s Alley with a hat, gloves and water bottle as well as some gear from Stonyfield including some Preserve products and a copy of Gary Hirshberg’s book Stirring it Up. It was a fun night and hopefully the just the beginning of the NH Running Blogger Meetup! If you’re local have you been to Runner’s Alley? If not what’s your favorite local running shop? Have you met up with bloggers in your area? That sounds like the perfect night to me! I wish I lived closer to my running specialty store. Unfortunately, it’s about 45 min away so I rarely make it there. BUT, when I do, I tend to leave with a ton of stuff!! Cannot wait to see you at the end of the week for RTB!!!! I can’t wait to see you too!!! I wish I was running with you but so excited that so many of my favorite bloggers get to run through my home state! Date nights are key! Runner’s alley is such a great store and the staff is so knowledgeable. Next time! Sounds like a great night! I hope you’ll do it again sometime! There is definitely another one in the works for the Spring gear release, I may also try to have another gathering in November. Just not sure if it’ll be at Runners Alley. I’ve never been to Runner’s Alley, but we do have a local Fleet Feet that is our running hub. We have a bunch of different groups that meet up there to train, but we’ve never organized a bloggers get together. Great idea! Blogger meetups are so fun! It’s great to talk shop and run together. That sounds like an awesome night!!! That would be such a fun place to work. I wish I lived closer to a running store….about 40 minutes is the closest and longer if there is traffic. Maybe I should open one! I am still on the lookout for that yogurt! :). It was so fun! I wish more had joined but we still had a blast despite the low attendance. Yogurt should be in stores soon! I think if you’re located near a Runner’s Alley and are a runner – you shop there. They’re so knowledgeable and have some great programs. I actually got started running through one of their 5k programs and have done some of the Winter Warrior runs too. They’re a great company/store! So true, they are a great store and a community hub. They have really helped me with shoes and their staff is always curious about races I’m running and how I’m doing. So friendly! I wish I had heard about it in time to make it happen. Sounds like a great time! Kristen, sorry you didn’t know about it! I will add you to the list I have of NH Running Bloggers! We are definitely planning a Spring event with Runners Alley and possibly another meetup before then in November. Looks like a great event! I’m going there this week to grab some new shoes… I am SO excited! Can’t wait for the next event so that I can go! They are the best for shoe fittings! I’ll keep everyone updated on the next event, we will definitely be doing a spring gear chat with Runner’s Alley in the spring, but there may be something between now and then. Awe how awesome!! Love blogging meetups! So FUN! It was so fun! Love meeting other bloggers! I wish I still lived in NH because I totally would have joined in! I love Runner’s Alley and I got fitted for my sneakers at the Portsmouth store. I don’t know any bloggers here in upstate New York, but I would love to find some.